Michelle O’Brien is a doctoral student in the Department of Sociology. Her research interests include the relationship between political conflict and migration. Her dissertation focuses on nationalism, anti-minority sentiment, and migration in Russia. Her ongoing collaborative projects with faculty have included projects such as developing an Agent-Based Model using survey data from Nepal, and unpacking the influence of cohort, conflict, and education on migration and marriage timing in Thailand. 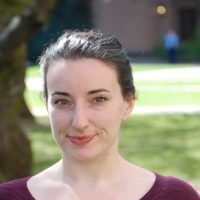 She received her MA in Sociology from the University of Washington in 2014. She received her BA in Sociology from the University of Michigan in 2007, with a minor in Russian Language, Literature, and Culture. In her time off before graduate school, she taught English in Moscow, Russia, and served as the Russian-speaking organizer for a labor campaign in Maryland.